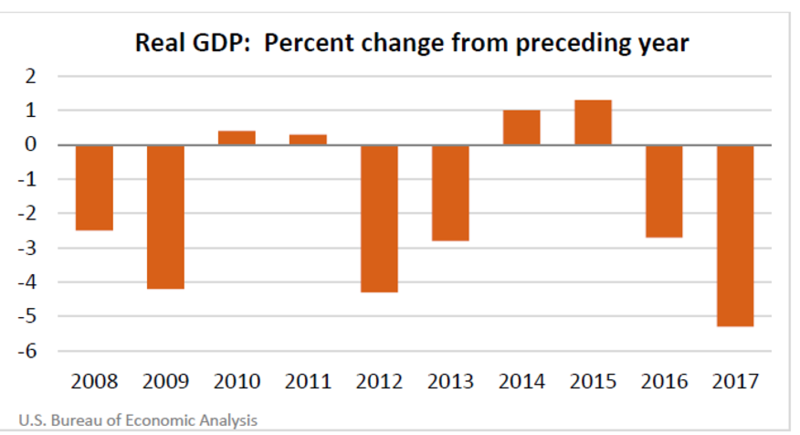 The estimates of GDP for American Samoa show that real GDP—GDP adjusted to remove price changes—decreased 5.3 percent in 2017 after decreasing 2.7 percent in 2016. For comparison, real GDP for the United States (excluding the territories) increased 2.2 percent in 2017 after increasing 1.6 percent in 2016. 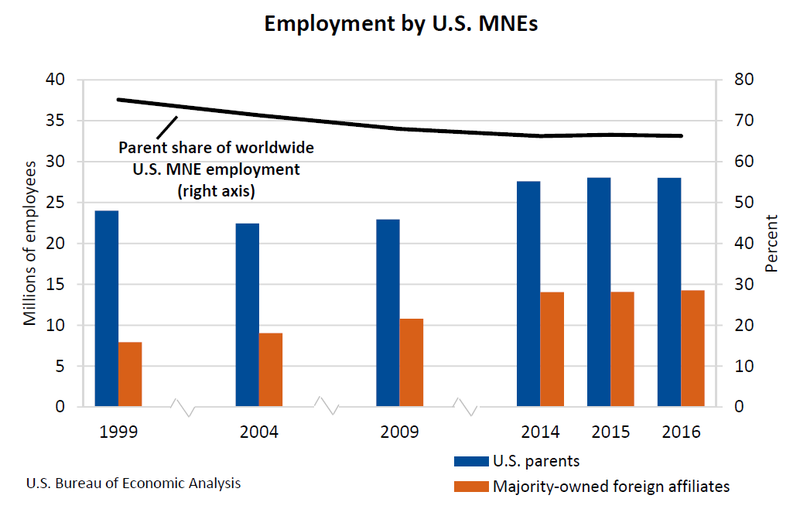 Worldwide employment by U.S. multinational enterprises (MNEs) increased 0.4 percent to 42.3 million workers (preliminary) in 2016 from 42.1 million (revised) in 2015, according to statistics released by the Bureau of Economic Analysis on the operations and finances of U.S. parent companies and their foreign affiliates. 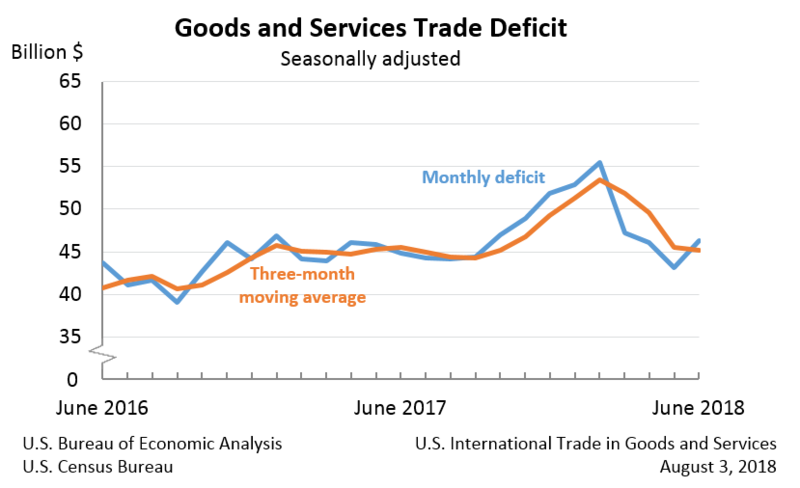 The U.S. monthly international trade deficit increased in June 2018 according to the U.S. Bureau of Economic Analysis and the U.S. Census Bureau. The deficit increased from $43.2 billion in May(revised) to $46.3 billion in June, as exports decreased and imports increased. The previously published May deficit was $43.1 billion. The goods deficit increased $3.1 billion in June to $68.8 billion. The services surplus decreased less than $0.1 billion in June to $22.5 billion. Personal income increased 0.4 percent in June, the same increase as in May. Wages and salaries, the largest component of personal income, increased 0.4 percent in June after increasing 0.3 percent in May. 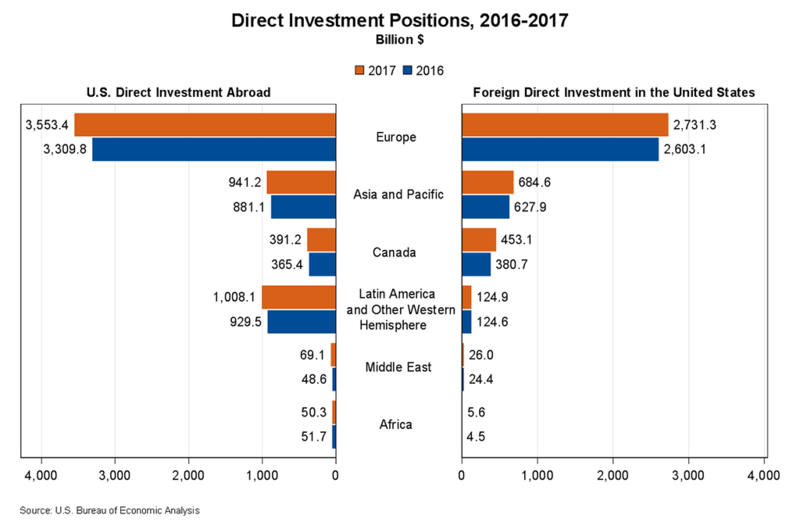 In 2017, the U.S. direct investment abroad position increased to $6,013.3 billion and the foreign direct investment in the United States position increased to $4,025.5 billion, according to statistics released by the Bureau of Economic Analysis (BEA). The increases were mainly due to increased investment with countries in Europe. 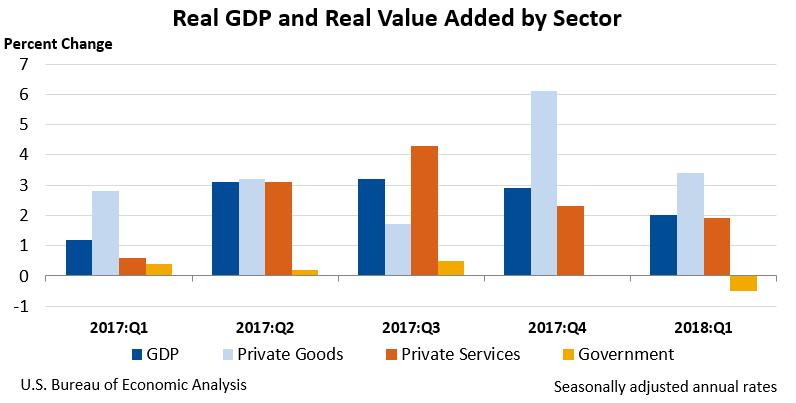 Real gross domestic product increased at an annual rate of 4.1 percent in the second quarter of 2018 (table 1), according to the "advance" estimate released by the Bureau of Economic Analysis. In the first quarter, real GDP increased 2.2 percent (revised). Real gross domestic product (GDP) increased in 48 states and the District of Columbia in the first quarter of 2018, according to statistics released today by the U.S. Bureau of Economic Analysis. 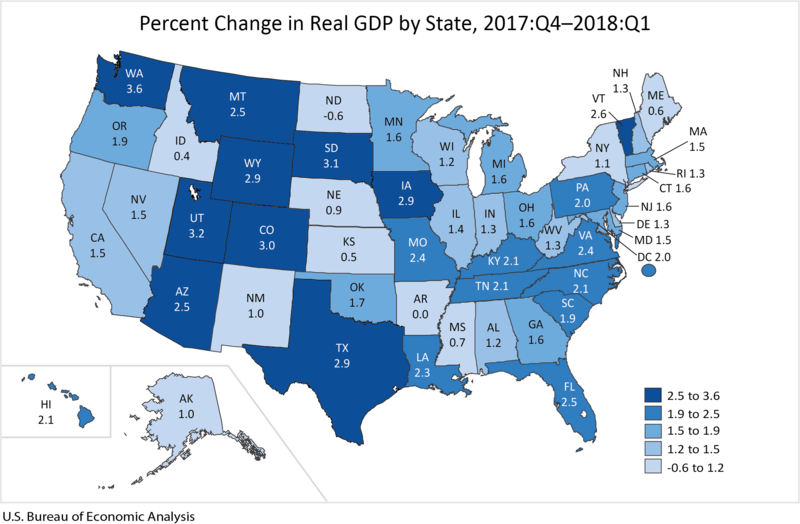 The percent change in real GDP in the first quarter ranged from 3.6 percent in Washington to -0.6 percent in North Dakota. 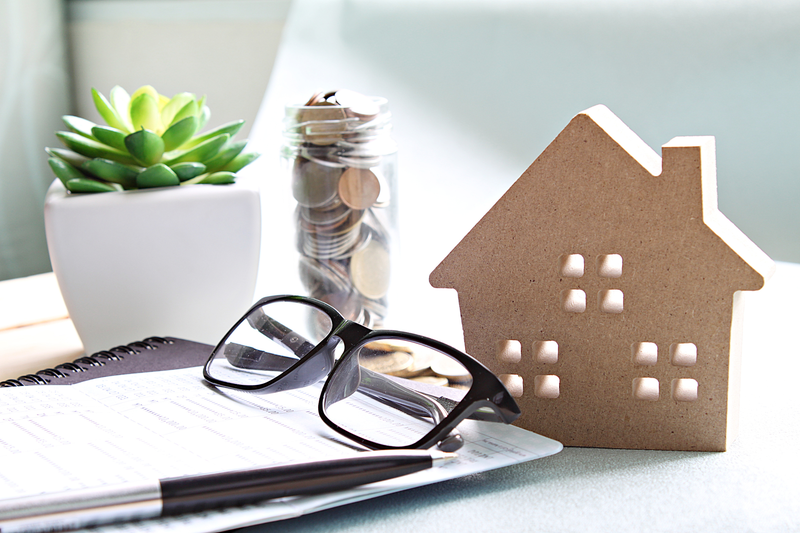 Real estate and rental and leasing; information; and nondurable goods manufacturing were the leading contributors to the increase in U.S. economic growth in the first quarter of 2018. According to gross domestic product (GDP) by industry statistics released by the Bureau of Economic Analysis, 14 of 22 industry groups contributed to the overall 2.0 percent increase in real GDP in the first quarter. Expenditures by foreign direct investors to acquire, establish, or expand U.S. businesses totaled $259.6 billion (preliminary) in 2017. Expenditures were down 32 percent from $379.7 billion (revised) in 2016 and were below the annual average of $359.9 billion for 2014-2016. As in previous years, acquisitions of existing businesses accounted for a large majority of total expenditures. 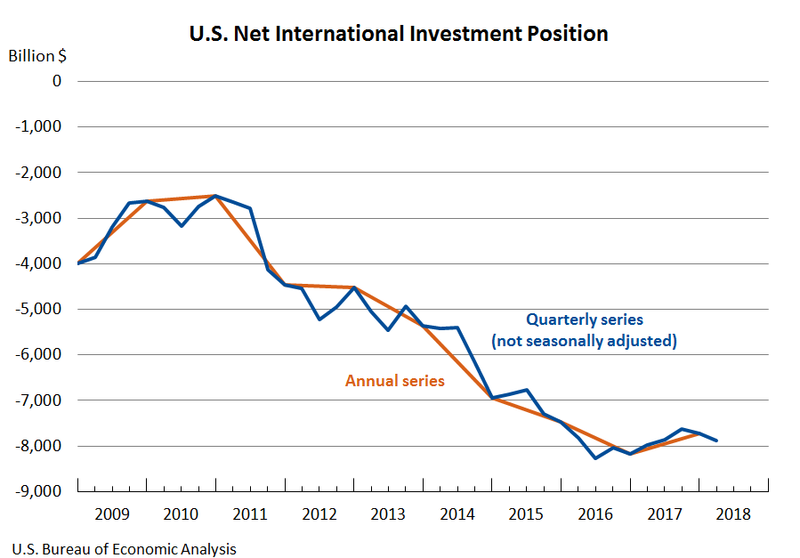 The U.S. net international investment position decreased to -$7,888.1 billion (preliminary) at the end of the first quarter of 2018 from -$7,725.0 billion (revised) at the end of the fourth quarter of 2017, according to statistics released by the Bureau of Economic Analysis (BEA). The $163.1 billion decrease reflected a $182.8 billion decrease in U.S. assets and a $19.7 billion decrease in U.S. liabilities. State personal income increased 4.3 percent at an annual rate in the first quarter of 2018, after increasing 4.7 percent in the fourth quarter of 2017, according to estimates released today by the Bureau of Economic Analysis1 (table 1). Personal income increased in all states and the District of Columbia. 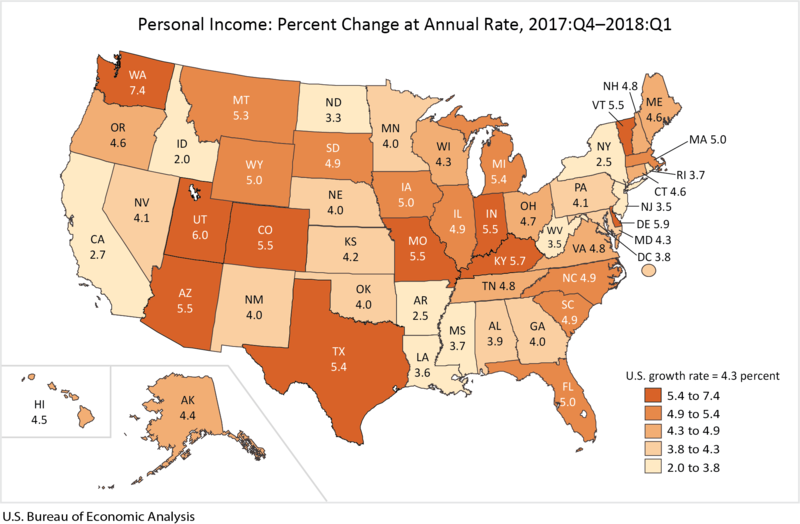 The percent change in personal income across all states ranged from 7.4 percent in Washington to 2.0 percent in Idaho. 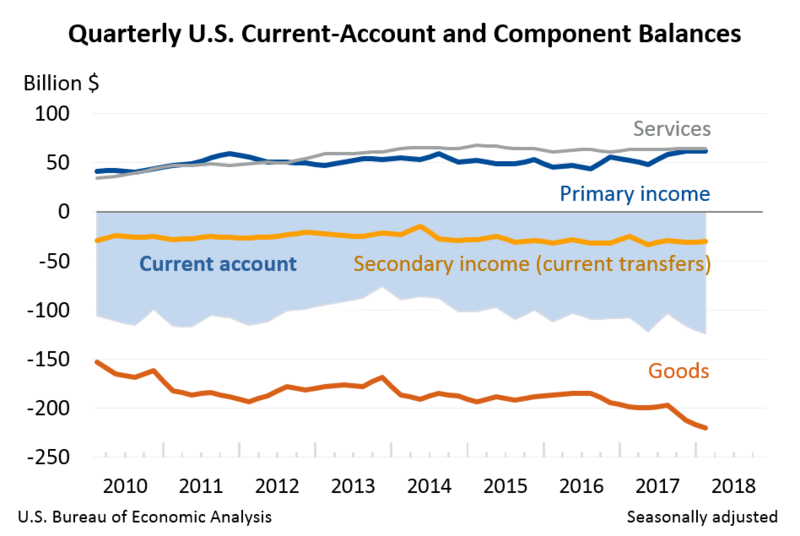 The U.S. current-account deficit increased to $124.1 billion (preliminary) in the first quarter of 2018 from $116.1 billion (revised) in the fourth quarter of 2017, according to statistics released by the Bureau of Economic Analysis (BEA). The deficit was 2.5 percent of current-dollar gross domestic product (GDP) in the first quarter, up from 2.4 percent in the fourth quarter. Real state personal income grew on average 1.1 percent in 2016, after increasing 4.7 percent in 2015. 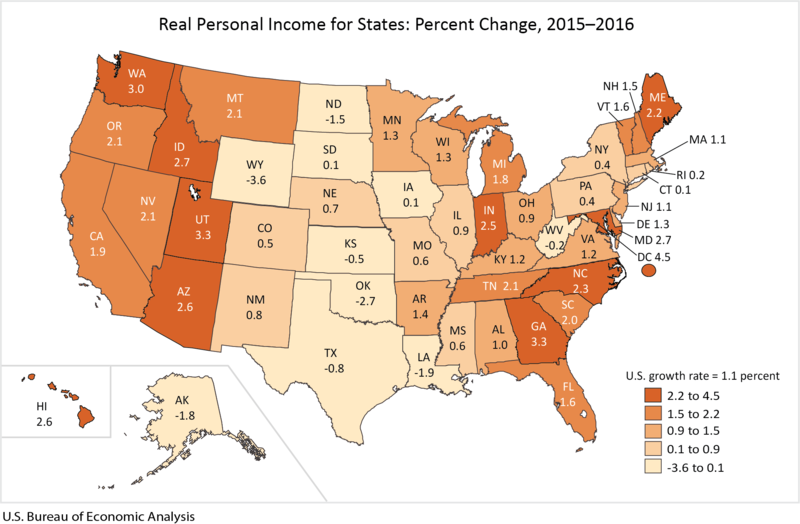 The percent change in real state personal income ranged from 3.3 percent in Utah and Georgia to -3.6 percent in Wyoming. In the District of Columbia, real personal income grew 4.5 percent. Across metropolitan areas, the percent change ranged from 6.6 percent in Jacksonville, NC to -8.1 percent in Midland, TX and Odessa, TX. Redfin specializes in buying and selling homes and uses a mobile app for tasks such as scheduling home tours and suggesting listings. CNBC&#039;s Morgan Brennan looks back at the week&#039;s top business and financial stories. *North Korea missile test sparks bond safety buying. NEW YORK, July 28- U.S. You&#039;re getting further confirmation that there&#039;s not a meaningful pick up in wages, which probably doesn&#039;t bode well for the outlook for inflation, &quot;said Subadra Rajappa, head of U.S. interest rate strategy at Societe Generale in New York.